In the ‘80s, Minneapolis was home to plenty of great bands like the Replacements, Hüsker Dü, Prince and Soul Asylum. Although the Jayhawks first emerged from that scene, the group played a different style of music with tunes steeped in roots/country-rock and power-pop. Now, the Jayhawks have just reissued their first five major label recordings on vinyl through American/UME. For the first time, 1992’s Hollywood Town Hall, 1995’s Tomorrow the Green Grass, 1997’s Sound of Lies, 2000’s Smile and 2003’s Rainy Day Music are all available on vinyl. The Jayhawks are touring in support the reissues. 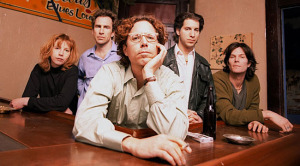 The lineup includes the players who appeared on the band’s 1997 shows – Gary Louris, Marc Perlman, Tim O’Reagan, Karen Grotberg and Kraig Johnson. Louris phoned from a Dallas tour stop to talk about the reissues and the tour. Earlier this year, the reissues were coming out. Everyone was available and really wanted to do it. We got the original lineup from that era. Kraig and Karen weren’t with us on Rainy Day Music but it’s the 1996/1997 through 1999 lineup. How much were you involved with the reissues? I was deeply involved. [As was] P.D. Larson from Minneapolis. He’s been a major component of the rock scene and goes way back the Reader and City Pages. He’s been there from day one with the Replacements and everybody. He’s a friend of mine and an archivist. I had all the tapes and CDs and cassettes and posters. He helped me sort through it. What’s it been like going back to those albums? Well, I’m not one who likes to go through a lot of my old stuff too much so that’s why P.D. was so valuable. I’m proud of those records and how much work we put into things. I appreciated everything a bit more with hindsight. It was fun, but I’m glad I didn’t have to do every little bit of it. P.D. sifted through it and gave me what he thought should be included. Sound of Lies was the first album that came out after Mark Olson’s departure. What was that transition like? It was really exciting and really scary. Mark obviously was a major component of the band. I had a lot of songs. If anything, we had too many songs between the two of us. Kraig brought in a more rock side to it and it clicked. We had a “nothing to lose” kind of attitude. We wanted to make the record even if everybody hated it. I love that record. It’s one record from start to finish that we could play. Every other record has a few songs I wouldn’t want to play. Then, we went out and it was a tumultuous time for me personally and with the band. The label had trouble with the parent company, Warner/Reprise. What label did it come out on? It was American. Smile was on Columbia – wherever Rick Rubin went, we went. It doesn’t seem like music he’d like. What did he like about you guys? Initially, it was George Drakoulias, his right-hand man, who brought us to the label. I remember Rick Rubin reportedly told him, “The Crowes could be the Stones and the Jayhawks could be the Eagles.” I don’t think any of us liked the Eagles. George thought we were more like The Byrds. Smile is generally seen as a shift in sound. Do you see it that way? Oh yeah. None of us grew up listening to traditional music or country rock. We all listened to rock. And a lot of British rock. I listened to electronic and art rock and that’s what I was doing before I got into a band. I was playing around with that stuff. It felt natural and with the “nothing to lose” attitude we thought we could explore anything with no consequences. It was going to be our last record anyways. Not so much. I don’t enjoy reading about rock. It’s inevitable you’ll read some because the label will send you the good ones. The bad ones are fun to read too. You just don’t want the middle of the road, two-a-half stars. You want someone raving or saying it’s the worst thing they ever heard. Rainy Day Music has more classic feel. Talk about your approach to that album. That record was a reaction to what we just did previously. We didn’t want to repeat ourselves too much. We did a big splashy pop record with drum machines and loops and things. We wanted to do something different. One thing we had never done which was to sing live. [Producer] Ethan Johns was into the idea of me singing live and playing acoustic and electric guitar live. It was light on the computer. It was analog two-inch tape. It was a statement that we wanted to do something really simple. The old was new again, so it was appealing. I found as time goes on, that record is the easiest to play live, especially acoustically. The songs seem to lend themselves to that. Will you record a new studio album? There are no plans at this point. I’m a little gun-shy. Last time, we wanted to recapture the gold and the chemistry wasn’t there. It was a fiasco and left a bad taste in my mouth. I’m a little wary. I’m trying to think of bands that regrouped and made their best record and the list is very short if any. We’re doing this right now and enjoying it. If we started writing songs and have some material, it would work. The material has to be there rather than us thinking we need to have a new album and writing the album. If there’s stuff that’s just kind of happening, then we’ll do it. 9:30 Club – Washington, D.C.